Can you imagine – what these people are trying to do ? Great example of what ‘people power’ can do. ..... in India, when we travel by Train – commonly we come across ‘adjust’ – even in reserved coaches – people would often ask for and be adjusted – i.e., what is meant to accommodate 3 – 5 or more would crouch ... and then in vacant seats, one would often find people placing their legs on the opposite seat – sometimes, one would not withdraw even when another passenger approaches ! ‘Tilting at windmills’ is an English idiom which means attacking imaginary enemies. Those here are not doing anything of what Don Quixote – the adventurer Alonso Quixano tried ... this happened at the land which boasts of Cricketers - Bob Simpson, Rod Marsh, Ric Charlesworth, Dennis Lillee, Kim Hughes,Adam Gilchrist and more ..... and here is a bunch of spirited people working together to do something with their bare hands ! They all captained Western Australia. Perth is the capital and largest city of the Australian state of Western Australia. It is the fourth most populous city in Australia. Perth is located on the Swan Coastal Plain, a narrow strip between the Indian Ocean and the Darling Scarp, a low coastal escarpment. Stirling railway station is a Transperth rail and bus interchange located 9 kilometres (5.6 mi) northwest of Perth railway station. Transperth is the brand name of the public transport system servicing Perth, operated by the Public Transport Authority. • Possess a valid ticket at all times and show it upon request. • Concession ticket passengers must carry proof of concession and supply it upon request. • Offer your seat to passengers with special needs, for example seniors, people with a disability and parents carrying small children. 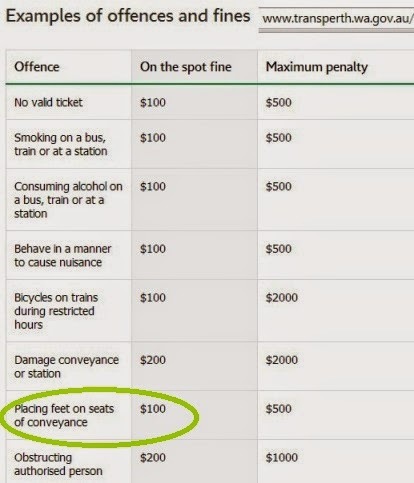 • If you are using the student fare, you should stand for adults. • Be courteous to your fellow passengers. We have a no-tolerance approach to offensive behaviour. • If you use a personal audio device, always use earphones keep the volume low. • Please keep your feet and anything that may cause damage off seats. • No smoking on any Transperth property; No eating or drinking on Transperth bus, trains or ferries. Now getting back – that group is trying hard to free a man who was trapped between a train and platform at a Perth station. Reports from Perth, mention that the commuter’s leg got stuck at Stirling Station about 8.50am causing a delay for the city-bound train. The fellow passengers got off the train and worked together to free the man by pushing against the carriage away from the platform. Great example of what ‘people power’ can do. 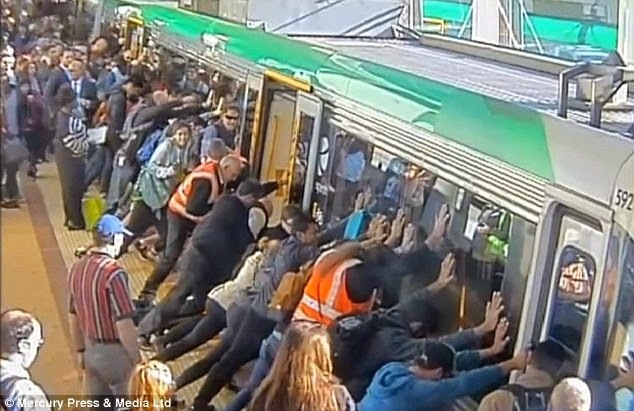 Transperth praised the actions of all who helped lift the train off the man.. it is stated that the incident was not a problem caused by overcrowding; Ambulance were called but the man escaped without injury. It was a case of Commuters and railway staff teaming up to free a man by rocking a train carriage to free his leg after he became trapped between the platform and a carriage on Wednesday morning. 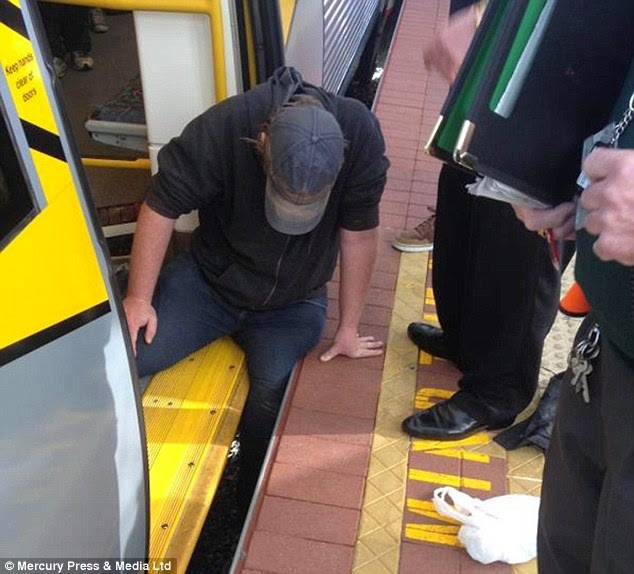 The man was boarding a rush hour train at Stirling station, 9km northwest of Perth, Western Australia, at 8.50am when he slipped and one leg became wedged in the gap. Quick-thinking passengers and staff saved the man leg's, as it was being squeezed by the 90-tonne of train, by collectively rocking the carriage. The quick thinking by people really helped – first they tried to move to one side – as it did not work, most got down, try to tilt the mighty train, which worked – as the man could free his leg without damaging it.